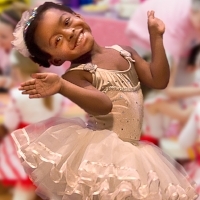 Entertain the guest of honor and friends (ages 3-6) with a fabulous Tiny Dancers™ fairy tale birthday party they'll cherish forever. Using our exquisite hand-crafted costumes and specially selected props, we'll treat the prima ballerina and guests to distinctive and original birthday dances set to great musical selections. Each child will go home with a memorable keepsake craft and, either a hand-made tutu and sparkling tiara or a sword, shield and swash bucklers sash. In addition, the guest of honor is presented with a special birthday gift from Tiny Dancers. Best of all, favorite stories will come to life as the dancers dress up and perform story selections carefully developed to encourage creativity and excitement. Birthday parties are 90 minutes long and include a Tiny Dancers instructor and party assistant to keep things running smoothly. Choose from over fifty different ballet stories (subject to availability). Please note that we only offer parties on weekends and due to picture days and recitals, we generally do not schedule parties from early May through early July. Use the link below to see available dates. Blank dates are either unavailable or already booked. Currently, we are booking about two months in advance with our online system. If you need a date further out, just give us a call. Additional children (up to 5) $25 each. If the party is to celebrate more than one child's birthday, there is an additional $25 fee. Please see payment policies page for more details.